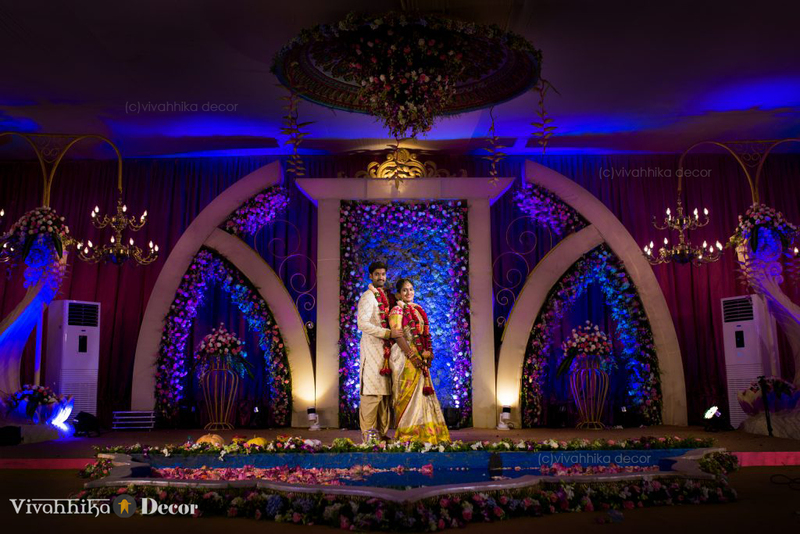 A typical telugu wedding décor has a lot of predictable elements – there is the stage backdrop of Tirupati Balaji and Lakshmi, the mandap which is fully decked in ‘gold’ and the opulent décor. But our clients from Gudivada would have none of it. They had decided that they wanted a grand but unconventional telugu wedding. One of the things that our clients requested us was to create a completely modern telugu wedding. So we were left to brainstorm and come up with different ways to design this grand yet modern wedding tale. 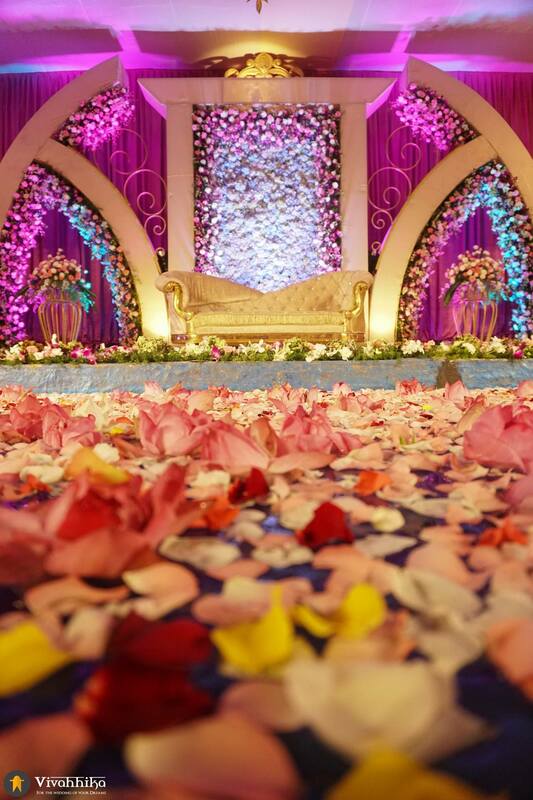 We had to unlearn everything we knew about telugu wedding decorations and start afresh. It was not long before we hit upon this amazing idea of using unconventional flowers for the whole of the wedding décor. We could use unusual and exotic flowers for the most part and stick to only a minimal amount of the commonly used blossoms like roses and sampangis. The exotic floral arrangements can be both the backdrop and the accents for this wedding. Of course, all of these flowers had to be fresh blossoms 🙂 And so, we had this fresh and original theme for this telugu wedding. 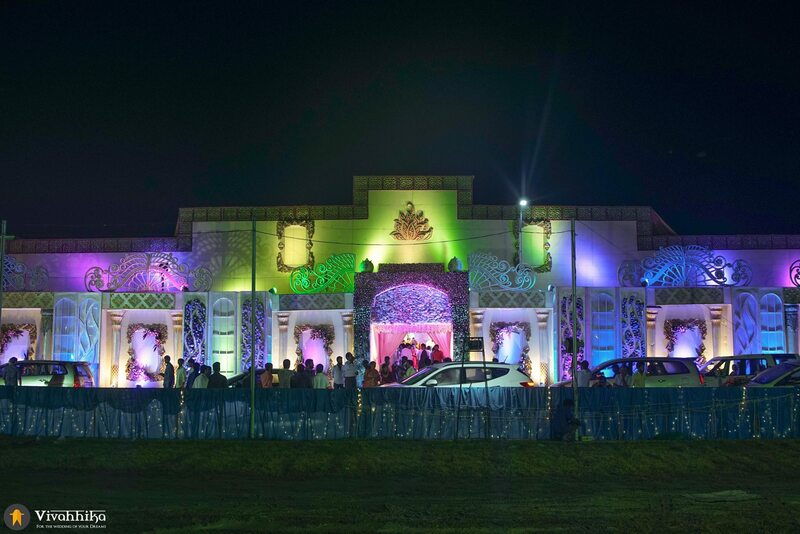 We were sure that this was a yet unseen attempt in Andhra Pradesh and we would make our clients’ wedding stand out as a contemporary event! Gudivada is one of the oldest cities in the coastal region of Andhra Pradesh. It is nearly 1000kms by road from Coimbatore, where we are located. So we packed and we packed and we packed, all of our wedding décor props into lorries to be taken all the way from Coimbatore to the wedding venue. It felt as if the entire company was travelling together. It turned out to be a great bonding time for all of us. We drove through heavy rains and mist and we reached Gudivada, a good 4 days before the wedding date. Having done barren-land transformations before we had become quite comfortable in this field. We got down to work immediately and started building the venue from scratch. We worked for four days straight with hardly any breaks in between. And sure enough, after 4 sleepless nights and tons of coffee, we had a spectacular venue hall. …no, things were definitely far from simple. Didn’t we just mention that the venue hall was finished a day before the wedding? Well, guess who decided to call in for the wedding as a last-minute guest – heavy-friggin’ rains! It poured cats and dogs hours before the wedding and a part of the roof collapsed in, letting the water flood the south-end of hall. Don’t worry! We were fully prepared with our safety measures to make sure no damage could affect this beautiful wedding. Within a couple of hours the roof was repaired and the water that had seeped in was cleared. Once we had replaced the the drapes, the venue hall was back to looking as resplendent as ever. Phew! Disaster averted! As decided, we were going to make unconventional flowers the star of the show. So, we couldn’t use jasmine or roses or any of the commonly-used traditional flowers as our central attraction. 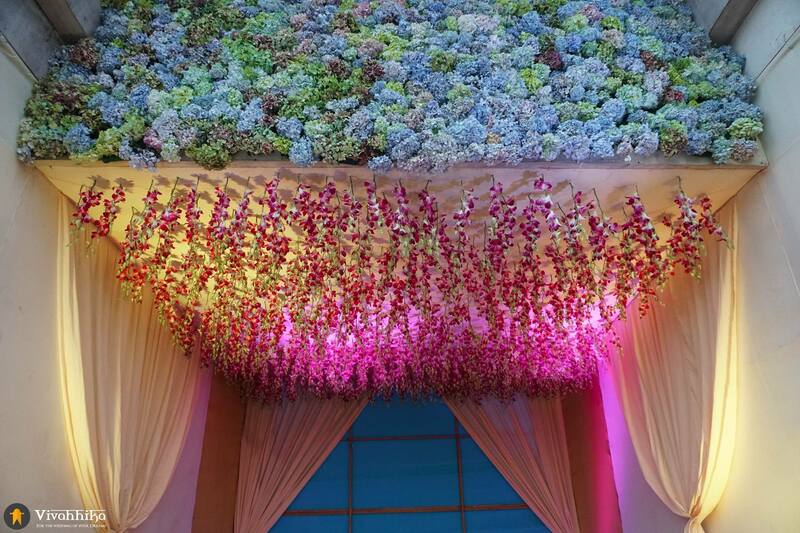 For the wedding stage we used a hydrangea floral wall and tall grill vases that held bouquets of hydrangeas. We had hung several chandeliers that shone a stunning golden sheen on the hydrangeas. 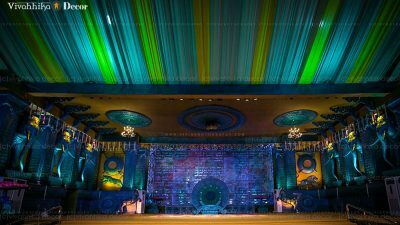 For a touch of grandiose, we even placed an oversized african daisy to the side of the stage. The elevation arch at the entrance was thronged with hydrangeas and orchids. These two floral arrangements were perfect for the ethereal lighting that we used. Together, the lights and flowers, gave the best welcome reception to the wedding guests. 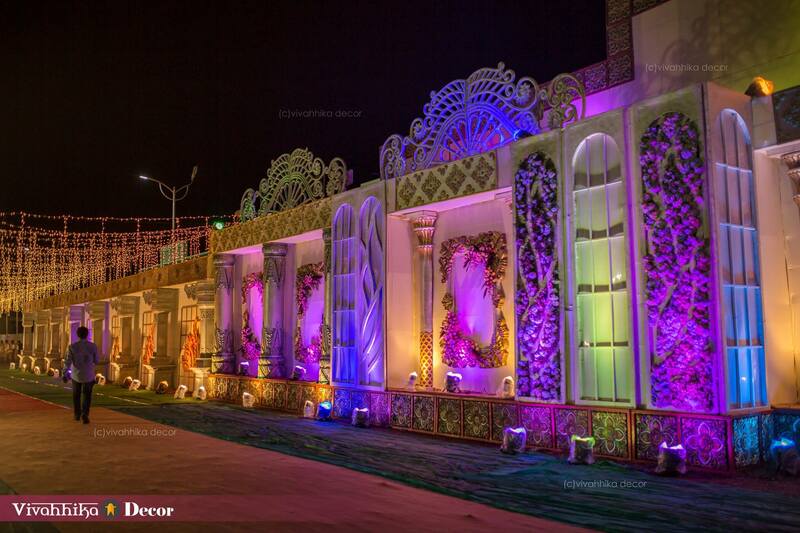 The pathway and sides of the venue hall were decorated with broad frames with intricate wood detailing. 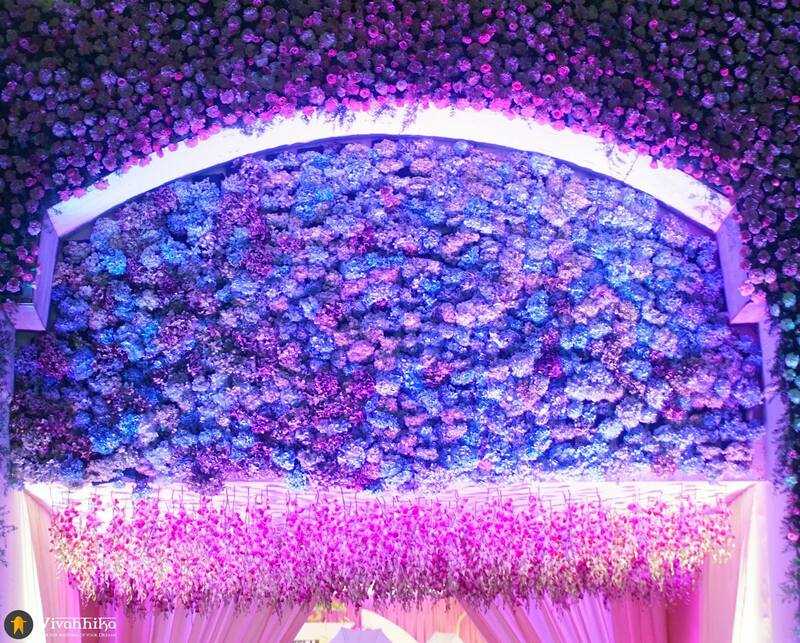 Bunches of hydrangea flowers were arranged on the frames and the whole portion of the wall was topped off with a big filigree-patterned crown. We set up a row of these frames along the side walls thus creating a pleasant ‘walk-down-a-hall-of-mirrors’ feeling for the wedding guests. We were all about the details. The ‘Kanyadhan’ is a lovely ceremony in Telugu weddings where the bride’s parents hold the girl’s hand and symbolically send her over to the groom’s family. 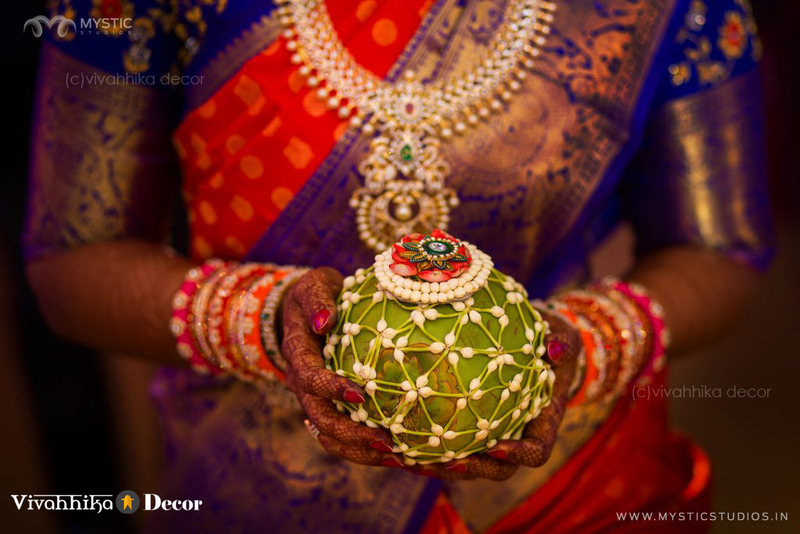 This ‘coconut cosy’ which was used for the Kanyadhan ceremony was fashioned out of Nandivardhanamu (Nandyavattam in Tamil) flower buds. Since exotic flowers were the heart of the theme, we wanted to use them to beautify the wedding as well as the bride. So, something to highlight the bride’s beautiful white and red muhurtham saree as she walked down to the wedding stage? Hmm…how about a dark ceiling décor with shining crystals and a ‘phoolon ki chaadar’ (poopandhal) made from orchids and nandivardhanamu buds streamers? Perfect! The theme of ‘Coral Glory’ was a modern interpretation of a telugu wedding tale. The highlight of this theme is the abundant use of exotic flowers like hydrangeas and orchids to enrich the wedding. We did this in a way that did NOT overwhelm the space. Even though there were so many details, the wedding hardly felt ‘heavy’ or opulent. 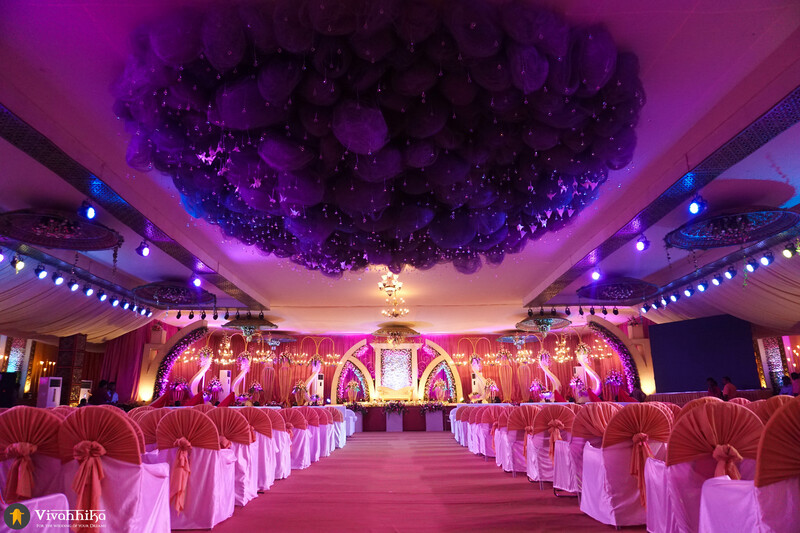 The combination of the exotic flowers and the ethereal lighting along with the draperies made the hall gleam in a unique coral shade. 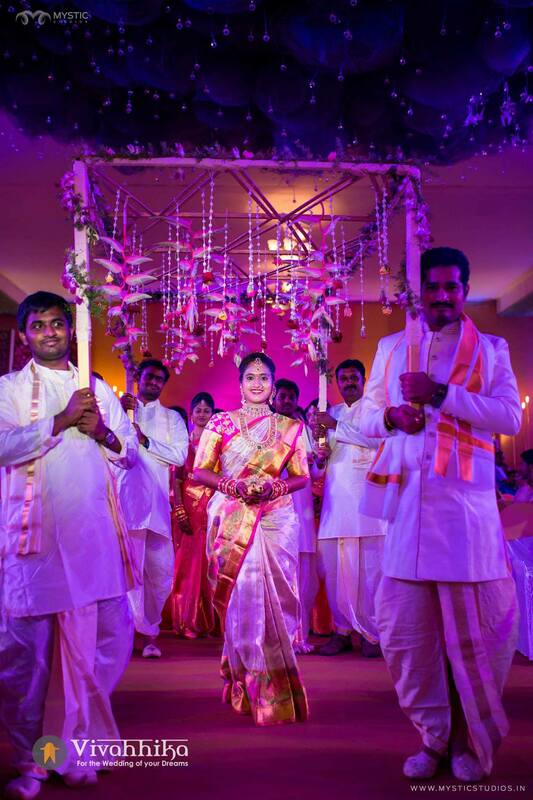 This particular combination of hues was a speciality in this telugu wedding as it portrayed contemporary weddings at its best. This telugu wedding was as exceptional and unique as our clients and we will definitely remember this as one of our best weddings. Our best wishes to the couple who shattered stereotypes! We wish Swapna and Kaushik all happiness in their future together. Are "lavish" weddings really a waste of money?